A powerful Pacific storm blew into Southern and Central California on Friday with wind-driven heavy rains that downed power lines and electrocuted a man, killed a motorist in a submerged car and disrupted hundreds of flights at airports. With the storm feeding on an atmospheric river of moisture stretching far out into the Pacific, precautionary evacuations of homes in some neighborhoods were requested due to the potential for mudslides and debris flows. 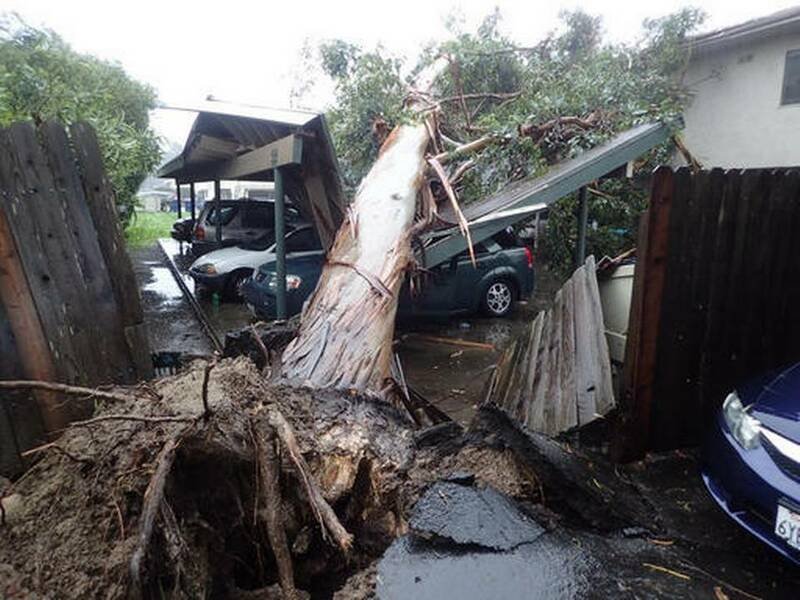 At least four people have been killed by the strong Pacific storm pounding California. More than 300 arriving and departing flights were delayed or canceled at Los Angeles International Airport. In the Sherman Oaks area of Los Angeles, a falling tree downed power lines and hit a car. A 55-year-old man was electrocuted and pronounced dead at a hospital, police and fire officials said. Winds gusting to 60 mph or more lashed the area. Heavy rains turned creeks and rivers into brown torrents and released slews of mud from hillsides burned barren by wildfires. 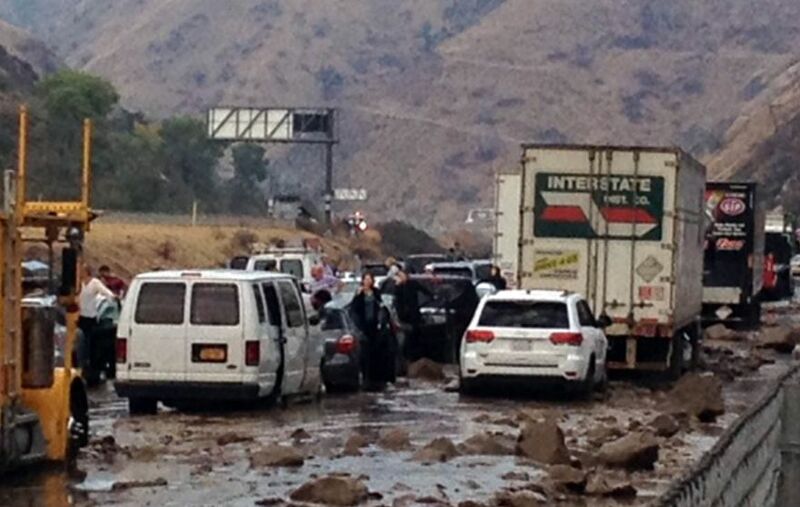 Several stretches of freeways and highways were closed by flooding. "It's crazy," said Robin Johnson, an academic adviser at the University of California, Santa Barbara. "It's just pouring down rain. The wind is just going nuts." "At one point the wind was so strong I'm surprised it didn't blow my windows out," retiree Phoenix Hocking said in a Facebook message from Carpinteria. In the desert town of Victorville, several cars were washed down a flooded street. A helicopter rescued one person from the roof of a car but another motorist was found dead in a submerged vehicle, San Bernardino County fire spokesman Eric Sherwin said. Elsewhere in the county, a 20-mile stretch of State Route 138 in the West Cajon Valley was closed at the scene of a summer wildfire. Mud sloshed over concrete rail barriers and about two dozen vehicles, including big-rigs and a school bus, were either mired in mud or became unable to turn around on the closed road and some were abandoned, Sherwin said. Two people in a car were rescued and four students on the bus were removed and taken to a school office, he said. Another road in the area was covered with 2 feet of mud. In LA's Sun Valley, 10 cars were trapped in swift-moving water on a roadway and eight people had to be rescued, the Fire Department reported. Using ropes and inflatable boats, firefighters rescued seven people and two dogs from the Sepulveda basin, a recreation and flood-control area along the Los Angeles River. One person was taken to a hospital with a non-life threatening injury. The storm took aim at Southern California but also spread precipitation north into the San Joaquin Valley and up to San Francisco. It was not expected to bring significant rain in the far north where damage to spillways of the Lake Oroville dam forced evacuation of 188,000 people last weekend. The National Weather Service said it could end up being the strongest storm to hit Southern California since January 1995. Rain and wind wiped out play in golf's Genesis Open at the Riviera Country Club in Los Angeles, where a eucalyptus tree cracked. Hundreds of trees and dozens of power lines had toppled in the Los Angeles area and at one point more than 60,000 city power customers were without electricity. A 75-foot tree fell onto an apartment building near the University of California, Los Angeles, narrowly missing someone who was in bed, fire officials said. Four of the six apartments have been declared unsafe to enter, prompting the evacuation of 16 college students. The storm system was moving "very slowly" eastward and Los Angeles County was expected to see more rain through Saturday, said Joe Sirard, a meteorologist with the National Weather Service in Oxnard. The city of Duarte, in the foothills of the San Gabriel Mountains east of Los Angeles, ordered evacuation of 180 homes below a burn scar. Up the coast, evacuations were urged for parts of Camarillo Springs in Ventura County and around an 11½-square-mile burn scar west of Santa Barbara. Santa Anita Park near Pasadena canceled all its horse races Friday. In Northern California, officials monitoring the stricken Oroville Dam on the Feather River said they were confident the reservoir would handle any runoff from expected storms because ongoing releases have been lowering the lake's level since its spillways were damaged last week.